A Cocktail And Street Food Bazaar Is Coming To Auckland! Guys, we’re calling it now. The pop-up of the year is coming to Auckland and, trust us when we say, you don’t want to miss out. Here for a good time and not a long time, The Botanical Bazaar showcases two of our favourite things: mouth-watering eats and inventive cocktails. Brought to us by Bombay Sapphire, the unmissable pop-up takes inspiration from the bustling markets and trade route of Silk Road. The result? Market stalls showcasing the vibrant flavours of Spain, Italy, Germany, China and Morocco—countries where Bombay Sapphire sources some of its ten botanicals to make its premium gin. And yep, you’re gonna want to eat (and drink!) it all. Each themed stall will feature a street food dish crafted by Jamie Johnston aka the genius behind Auckland’s much-loved Judge Bao. Bombay Sapphire’s Chase Bickerton will then take things next level by pairing each dish with a unique gin-based cocktail. Our advice? Arrive hungry and thirsty—you’ll be tempted to try ‘em all! Running for just five nights from November 1 to 5, the market will be held at Fresh Factory in Eden Terrace. Now in its third year, the highly anticipated gin pop-up promises to be bigger and better than ever with the atmosphere of a bustling bazaar—complete with live DJs. And, if you thought gin could only be mixed with tonic, think again! The innovative concoctions will challenge your taste buds and preconceptions in the most incredible way. Go on a culinary journey to Morocco with harissa chicken wrapped in filo pastry, washed down with a refreshing ice tea cocktail chilled with theatrical dry ice. Alternatively, visit China with a dragon tiki sling bursting with pineapple and a whooole lot of funk—it’s the perfect match for rich sweet and sour pork. 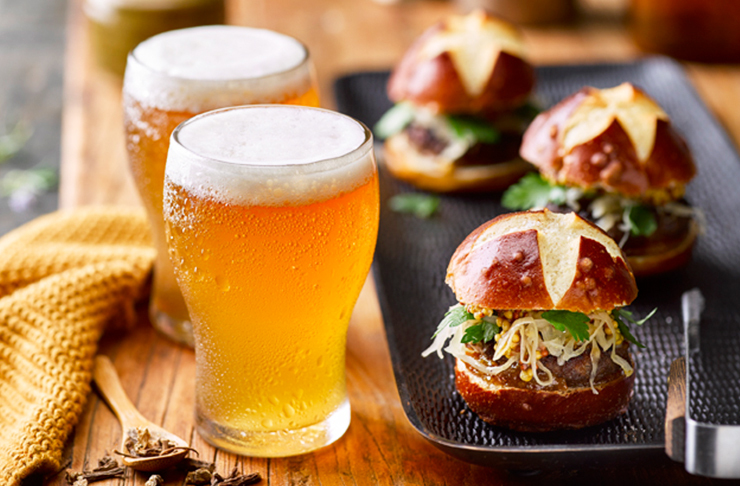 We’re excited to devour the German-esque pretzel burger stacked with bratwurst, sauerkraut and onion beer puree. Keeping in theme with all things Germany, the matching cocktail features Mac’s beer—a surprisingly great combo! Arancini alongside Aperol (and gin, of course) will take you to Italy, while the Spanish-inspired migas breadcrumbs are matched with a game-changing G&T. Rest assured, Jamie is dedicated to catering to e’rryone with vegetarian, vegan and gluten-free options on the night. One thing’s for certain: there’s no need to fork out on plane tickets to eat your way around the world. The Botanical Bazaar has ya back with its show-stopping eats and drinks. This is one event not to miss. See you there! Click here for more info and to grab tickets. Editor’s note: This article is proudly sponsored by The Botanical Bazaar and endorsed by The Urban List. Thank you for supporting the sponsors who make The Urban List possible. Click here for more information on our editorial policy.